Easyhost Belgium Review 2019: Is Easyhost Belgium a Good Hosting? A reliable and budget-friendly web hosting provider from Belgium, Easyhost also offers website builder options, free domains, and free SSL certificates. You'll have to watch out for its poor customer support, however. 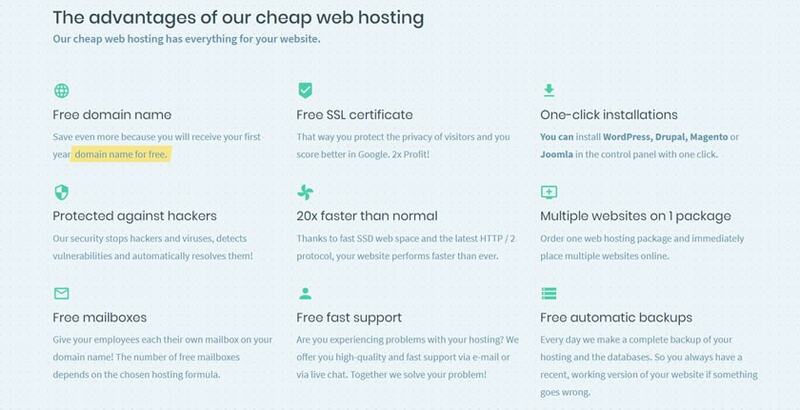 Founded in 1999, Belgium-based Easyhost isn’t a new player on the web hosting scene. It specializes in providing inexpensively-priced hosting solutions along with other essential services such as domain registration and SSL certification. With several quality accreditations including ISO 27001, ISO 9001, and ICANN, Easyhost now boasts over 150,000 satisfied customers in Europe. It has a polished and informative website available in English, French, and Dutch. Easyhost has an eco-friendly yet state-of-the-art data center in Brussels, Belgium, in which it houses its servers. But by far one of the most impressive features I’ve seen with this service is its high availability. Because of the number of failsafes the company has put in place, Easyhost can guarantee a 99.999% network uptime — which is far superior to most shared hosting services. Essentially, even if your server fails, your hosting will be automatically transferred to a new server to make sure your website is back online in seconds. Although I would’ve loved to see CDN support, Easyhost secures your web hosting with a range of security options within all its hosting packages. This includes free SSL certificates, malware scanning, web filters, DDoS protection, Zend optimizer, firewall protection, and automatic patching to fix any security leaks. However, where Easyhost falls short is on web space. It only provides from 50 GB to 100 GB SSD storage (albeit with unrestricted bandwidth). This is great for small to medium-sized websites, but once your website gains a certain level of momentum, you’ll need far more space than Easyhost offers. That said, the company does throw in a free one-year domain registration with each paid plan, making the platform a fairly all-inclusive and convenient option for many. Easyhost also provides a handy custom control panel through which you can easily install your favorite CMSes such as WordPress, Joomla, Drupal, or Magento in a single click. There’s also a website builder available, but this will be a separate subscription. 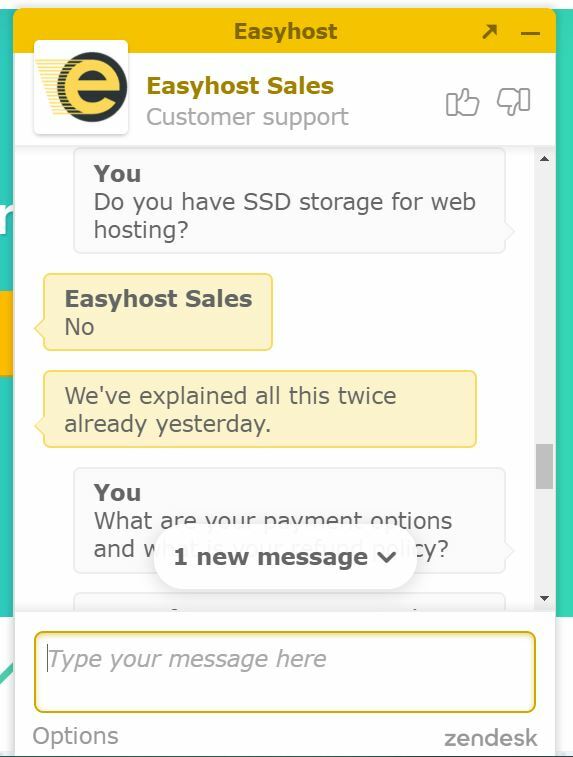 You can spot the word “cheap” several times throughout Easyhost’s website, but does the company really live up to its claims? As a matter of fact, it does. Even though it isn’t the cheapest hosting provider I’ve come across, it offers budget-friendly packages with a number of great freebies. Easyhost has several support channels including live chat, support tickets, email, phone, and a knowledge base. But what good are these, if the support staff are neither efficient nor accurate? I submitted a ticket with basic questions about the service, but the response I received was inaccurate and didn’t answer most of my questions. Easyhost provides an average web hosting service at best. Though it’s quite affordable, it has one of the worst customer support I’ve seen and offers limited disk space to its customers. Wondering how Easyhost Belgium stacks up against other Web Hosting companies? Enter any other Web Hosting company and we will give you a side-by-side comparison.